For those even remotely interested in records and record collecting culture, the concept of Record Store Day can seem like nothing short of a godsend. An annual corporate sponsored event every April 19, Record Store Day has grown substantially in size and stature since its 2008 inception: the first Record Store Day in 2008 only had less than a dozen special releases and by 2012 there were more than 400. The event focuses entirely on the promotion of independent record stores, record labels and the records they put out. If that weren’t enough, Record Store day also comes every year with a slew of new and exclusive releases from a litany of artists, ranging from hyper-intensive deluxe editions of beloved albums to one-off singles and beyond. Record Store Day isn’t all wine and roses, however. For a significant number of independent record stores, Record Store Day is an opportunity to make considerable amounts of money. The vast majority of the independent record stores that recognize this, offer live music, free food, guest DJ’s and other attractions throughout the day to continue to lure patrons into the magical world of analog media. The sad truth here is that these aren’t practices that almost all independent record stores can’t afford to keep up the other 364 days of the year. The money these stores make on Record Store Day is certainly substantial, but it does nothing to help them continue to make money after the day has passed. The glut of Record Store Day exclusives doesn’t exactly help either. For one thing, these exclusives promote behaviors that are probably some of the most damning things affecting record collecting culture today. Instead of purchasing music to listen to it, or just to support the artists involved, these exclusives promote the idea that records are the latest transient medium to briefly gain the attention of young people. 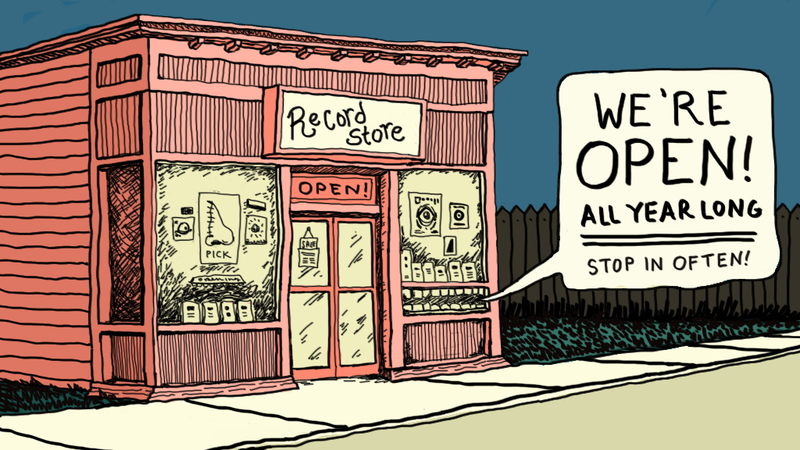 To the contrary, records represent one of the longest-standing mediums in music history. These exclusives are tailor-made not for the type of person who genuinely just enjoys the thrill of owning a new record to take home and listen to, but for people who won’t buy an album unless the vinyl has at least three different colors on it and who judges you for actually listening to your albums on your non-Crosley turntable. They’re novel ideas that ultimately, and unfortunately, spend less than half as much time in the loving hands of enthusiastic owners than they do sitting on eBay and Discogs for three times their retail value. These record-flipping armchair-warriors come out in droves only one day of the year — partly to pat their own backs for “supporting” local businesses, but mostly to get some fast eBay cash. Do they ever come back when the promise of a cool $300 to be made on Discogs isn’t as prominent? These Record Store Day exclusives are also often incredibly complex to produce, and their production can back up record pressing plants for months on end (see: Jack White’s various pet projects every year. Nobody who actually enjoys listening to records wants a 1RPM record or one filled with water. Stop ruining everything cool and fun. ), and steal valuable time away from artists and record labels who actually need to make money off of their album sales. Local, independent record stores are glorious institutions for countless reasons: They can help connect you on a more tangible level with the music you know and love, they can make you aware of other events going on in your own city that you might not have known about and they can broaden your interests and horizons in ways you didn’t even deem possible. Record Store Day does nothing to promote these intrinsic and invaluable traits of record stores and record collecting culture, and instead promotes a fickle, self-aggrandizing me-culture that’s over-saturating a sincere, earnest society of music lovers with trend-hoppers and social climbers. This Record Store Day, go out and buy some albums. Pick up that cute little The Cure/Dinosaur Jr. split 7”, that Candy Apple Grey repress or that CCR singles collection. Just actually listen to them before you file them away into your Discogs milk carton, and don’t wait an entire year to go back. I'm the Online Managing Editor here at ye olde Reporter. What's up!